About a year and a half ago I got an invitation to play the five Beethoven concerti as well as the "Choral Fantasy" all in one week in a city about an hour west of Chicago called Rockford, IL. I do have admiration for musicians who can perform a whole body of work of one composer (or more for that matter) in a short period of time, however such a thing is not really a goal of mine, so I approached this undertaking with a bit of suspicion, and questioning. What happened, though, in the course of that week I will forever cherish and hope to expand to other places, and with other composers. Owing to the breadth of the repertoire and the sheer size of the forces involved, this Beethoven project resulted in important discoveries for me personally as well as for the orchestra and the community. When first discussing this project with Brian Ritter (the orchestra’s Executive Director) and with Steven Larsen (the orchestra’s Music Director), we decided to structure the festival chronologically in order to present a narrative through Beethoven’s life and work. After this week-long festival, we - the orchestra, its staff, its patrons, the audience, and me - discovered that this journey changed us in many different ways: Beethoven took us on an emotional roller-coaster, and at the end of it we were different persons than at the beginning. The Executive Director of the orchestra came to me after the second concert saying, “They got it (the audience), the journey that we were undertaking.” He felt, as I did, that this second concert, after having the perspective of the first, allowed everyone to begin to experience the process and progress of Beethoven’s life and music AND to be able to relate and create one’s own internal dialogue when listening. Brian and Steve had the wonderful idea of engaging in a brief discussion before each concerto. After careful preparation, we presented each concerto in its historical, biographical, and creative contexts. This transformed the concert hall into an intimate living room (a very large one at that) in which we were inviting people to experience something that we felt so passionate about. In addition to the concerts and pre-performance talks on stage, the orchestra organized lectures, film screenings, and panel discussions throughout the week. What was so incredibly rewarding was the intensity of rehearsing and playing these masterpieces, all within a week’s time. Each concerto has such emotional depth, inspiration, originality, and imagination. It was completely overwhelming, yet, at the same time, one could sense that one’s relationship with this music was deepening, becoming closer, opening as the week progressed. Normally when I am invited to play a concerto, I always play the work for the conductor prior to the first rehearsal. But I never had the experience of playing for a conductor one concerto, and then another one, then more, and more, and more…. By the 5th concerto, I was absolutely drained. Maintaining concentration and focus as I played through all five in preparation for the following day’s double rehearsal in which we did all five with the orchestra was a particular challenge and contributed greatly to the general emotional intensity of the project. The first concert (Sunday matinee) was titled Beethoven Revealed. We began with a brief discussion about Bonn in 1770, Beethoven’s early education, his admiration of Mozart, the move to Vienna, and his studies with Haydn. Slides of Bonn, Vienna, the meeting with Mozart, the princes’ salons in Vienna, and Beethoven at 25 were projected on stage behind us. Following this short presentation was the performance of the 2nd piano concerto, which, in fact, was the first chronologically speaking that Beethoven composed. On the second half, we discussed the characteristics of Beethoven’s early compositions: virtuosity, improvisation, the influence of Haydn and Mozart, the originality of his ideas, all accompanied by related slides, and then delved into the 1st piano concerto. 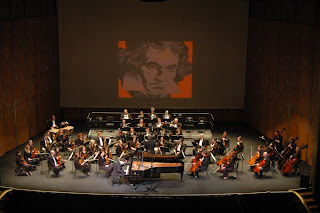 As an encore, we decided to do a “teaser” to set the mood for the up-coming concert entitled Beethoven Betrayed, so we played the second movement of the 4th piano concerto. I have to admit that this choice of the encore was somewhat selfishly motivated in that I wanted to have an extra rehearsal! The Chicago Tribune mentioned the up-coming two concerts and selected them as “Critics Picks”. This mentioning, along with the interviews on TV and radio, breathed even more excitement into the community. The next concert was on Tuesday evening. It included the 3rd piano concerto on the first half and the 4th piano concerto on the second. We discussed Beethoven’s deafness resulting despair that ultimately led him to write the famous Heiligenstadt Testimony, which we rea d in parts. The slides in the background were of Beethoven at 34, his Ear Trumpet, the city of Heiligenstadt, and a facsimile of the Testament. Playing such a work as Beethoven’s 3rd Concerto usually requires some time afterwards to regain one’s strength. But in this case I only had 5-10 minutes to warm up and play the 4th piano concerto. Before tackling this beautiful and haunting work, we talked about the “Heroic” Beethoven as well as the mystery of the “Immortal Beloved”. The audience was ready for another encore, which was (in the spirit of the previous idea), the Recapitulation of the last movement of the 5th piano concerto. With three days between the second and third concerts, I offered to do some ‘outreach’ activities for the orchestra and the community, especially since I am strongly committed to sharing this incredible music with everyone. The orchestra organized all sorts of events: at local schools, house concerts, lunches with patrons… These activities were extremely rewarding because they allowed me to go into the community and interact with persons of all ages and interests in music. In other words, this allowed me to get even closer to the community where I was performing. The third and final concert—Beethoven Triumphant—took place that Saturday evening. Before tackling the ‘Emperor’ concerto on the second half, the orchestra performed all of the incidental music for Egmont before the intermission. To put the music in its historical context, we talked about Napoleon and Vienna during the wars of the first half of the 19th century. We also revisited some of the compositional characteristics of the earlier concerti and demonstrated how they were further developed in the 5th concerto (‘Emperor’). For the encore that evening, my idea was to play the last movement of the 2nd concerto, which was the first work of the festival, in order to close the circular journey. However, just before the concert began, I asked whether the orchestra had the music for the encore. Since that concerto was done the previous Sunday, the music was locked in the orchestra’s offices, which are located in a building that was closed for the weekend. I then talked to the Executive Director asking him to find a way to get the music (“call the mayor if you need… someone has the key….”). The level of commitment from everyone for all of this to succeed was just so thrilling and inspiring. The Executive Director knew we needed to find a way to get the music, and he did. I shared this story with the audience after the performance of the “Emperor”. We then returned to that movement and closed the circle. During the applause, all of us in the hall felt that we did not want this journey to come to an end. It was intense; it was human; it had its ups and downs, ambition and promise, tragedy and despair, triumph and hope. It was indeed a festival devoted to Beethoven’s music and thus really a festival devoted to us as human beings. During the last discussion with the conductor prior to playing the 5th concerto, I said that with Beethoven one never feels a sense of arrival but rather a sense of departure. After this final encore, I think that we all felt that, rather than arriving at the end, we experienced something new, a new departure into the future, something that I hope continues with a future project. Perhaps, with “The Robert Schumann, Clara Wieck and Johannes Brahms Love Triangle” festival in 2008-2009. I can’t wait. wonderful blog and insight, Alon! Thanks for sharing it, and congrats for taking on such journey! I enjoy reading your blog immensely, just as I enjoyed our conversation a few days ago. It is clever and very well writ. I am looking forward to attend the concert.